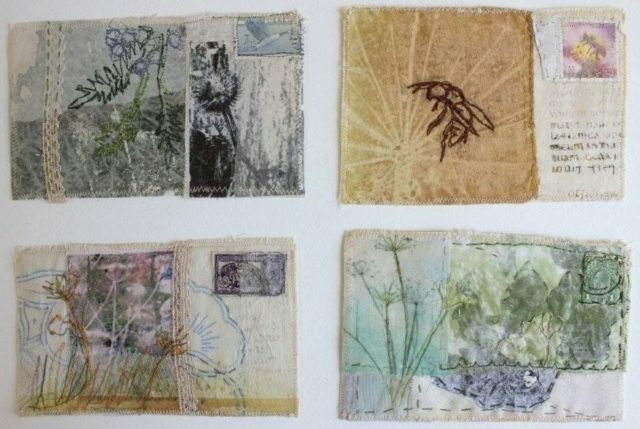 Cas Holmes – Postcards is an introductory workshop marking your places of interest you. 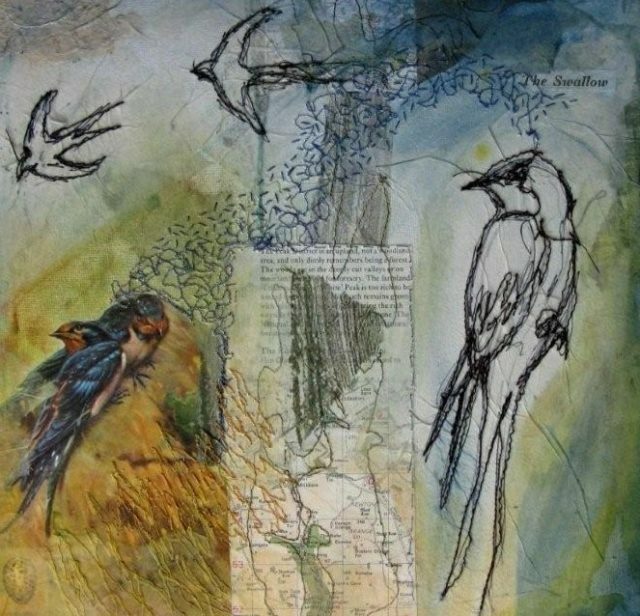 Returning to Eau Brink Studio for this one day workshop to inspire you to record your travels. What landscapes and images seen on your travels would you represent on your postcard? We will share processes and ideas based on some of the artist’s personal approaches to creating mixed media works with found materials. We will look at transforming paper to turn it into a cloth-like feel through Momigami (Japanese crumpling) and combining it with textile and stitch to create small postcard size samples. The focus will be on hand stitching as an extension of mark making and drawing. Gardens or Natural History:Images and text relating to plant, insects, birds. (based on the idea of a Planthunter or naturalist recording.their world. Paper and textiles inspired by your theme. Papers: Brown wrapping paper or large brown envelopes, tissue paper, Collect assorted waste papers from patterned paper bags, magazines, oriental specialist papers, sweetwrappers, printed photocopy paper etc. Gathered fabric scraps: Writing, prints, lace, scraps of cotton/ linen, silk fabrics with or without prints- various sizes. Small Objects of desire with Cas Holmes learning how to make art from found materials. Found paper, fabric scraps and found materials will be combined with transferring of images and stitch as a means for informing work for the development of new ideas. These will be constructed on a small canvas . Also useful camera for documentation, notebook, drawing media.